Best treatment for diabetes to ensure best results rely on the expertise of specialized multidisciplinary medical personnel who provide information to the patient which can then lead to effective self-care. 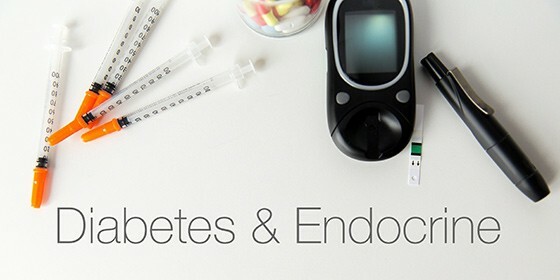 The Diabetes and Endocrine Clinic was created with the objective of providing specialist medical staff that can provide expertise that is of a high standard. This includes providing patients with necessary information. We also aim to provide services in treatment of thyroid conditions such as thyroid disease, pituitary gland disease, high cholesterol, obesity, high blood pressure, calcium deficiencies, and osteoporosis. 1. Provides a center of expertise in diabetes and metabolism: physician, nurses, diabetes specialists, nutritionists, activity coordinators, pharmacists, and foot specialists. 2. Fast and Accurate Diagnosis (Quick Lab) Helps to reduce the wait in blood test of: FBS, Cholesterol, Triglyceride, HDL , LDL , BUN, CRE, Uric Acid, POCT HGT , POCT HbA1c , POCT Micro albumin urine It takes an average of 7 minutes to perform the test. 3. Test for coagulation in arteries or throughout the body use the ABI equipment designed for diabetes patients. 4. Treatment, diagnosis, and prevention of complications that arise from diabetes such as micro albumin urine test, eye test, testing blood sugar levels (HbA1C), referral of patients to specialists in the fields of heart, kidney eyes, surgery, and foot.